July is coming to an end but I’m no where near ready to let go of summer just yet! It’s a good thing we still have the entire month of August to enjoy. In celebration of my favorite season, I’m sharing an amazingly adorable summer house decorated by Tracey Rapisardi, one of my favorite interior designers. Her style is always light, fresh, pretty and feminine. This is my dream kitchen! 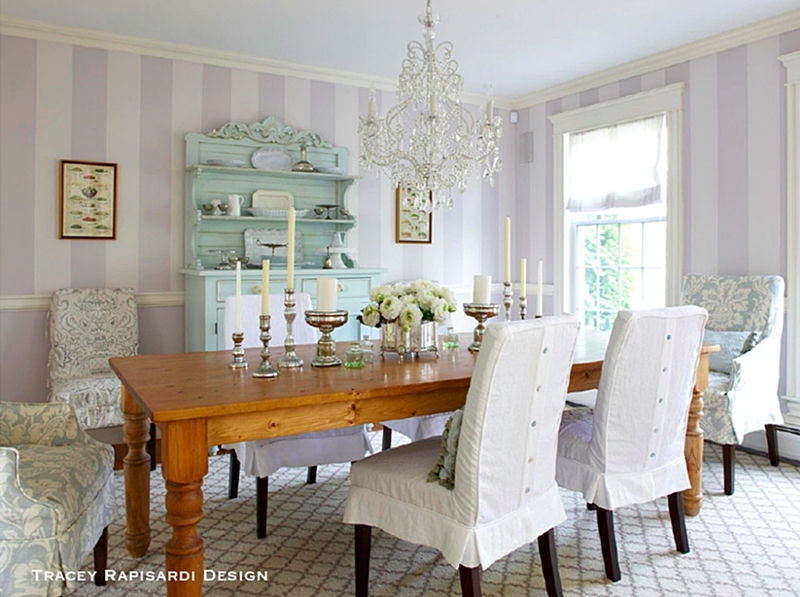 White cottage style with strokes of ocean colors in blue and green, and a pinch of pink thrown in just for fun. I love how she used a dark gray counter above the cabinets, but incorporated a butcher block counter on the kitchen island. I think this adds more interest than keeping the same counter tops throughout the room. 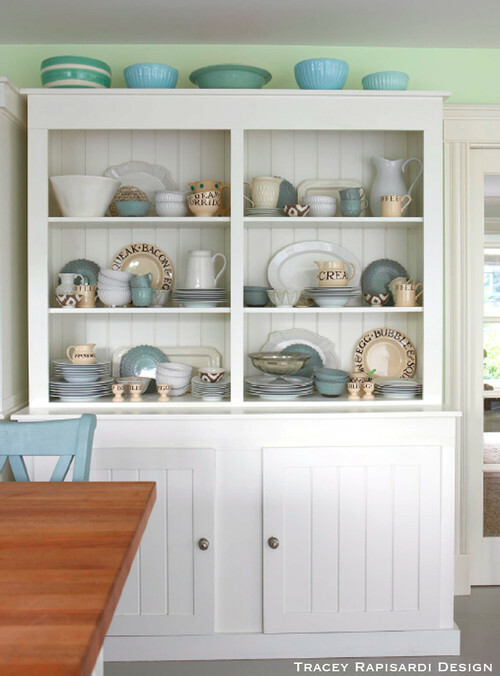 A shabby chic dining set takes up resident in the kitchen’s breakfast nook. Gingham check cushions match the pale gray swirl rug underneath. I have to confess. I don’t understand why people put rugs under dining tables where food can spill and create stains. I love the way it looks; I just don’t understand the practicality. So if someone knows of a good reason other than aesthetics, please clue me in! 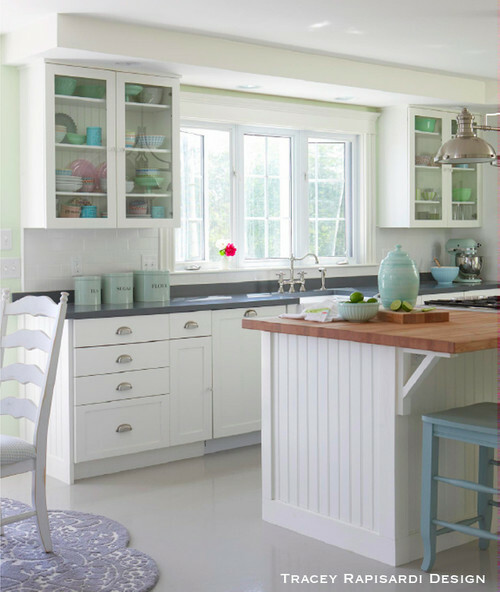 You catch a glimpse of the kitchen island that serves double duty as a cook top and eating area, but the true star in this photo is the beautiful bead board cabinet with its collection of dining ware. 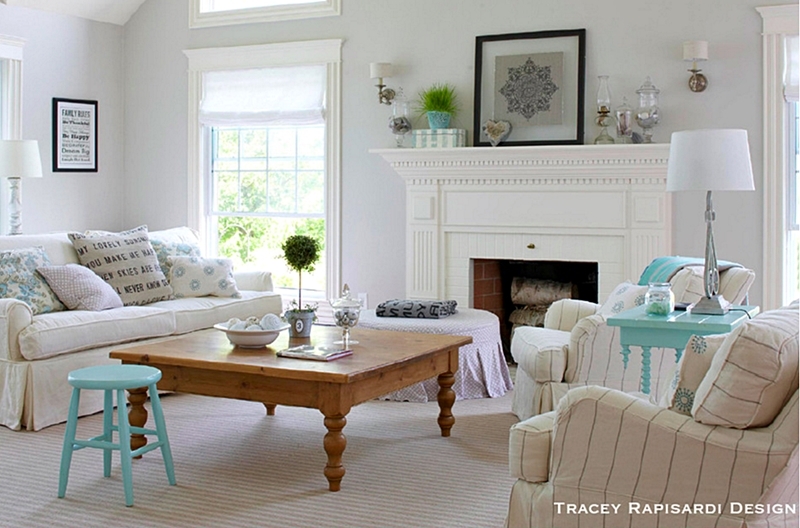 The summery family room may be white, but it’s practical at the same time. Slip-covered furniture is easily cleaned and can handle heavy use. I’m in love with the wood farmhouse-style coffee table and need to find one just like it for my family room. A large Palladian window lets in ample light. This style of window is often seen in Renaissance architecture. 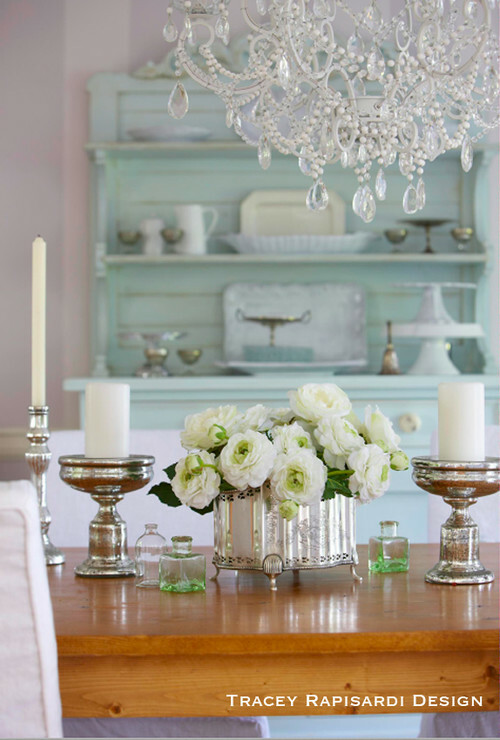 Shabby chic style infuses the summer house’s dining room with fresh appeal. Once again, slip covers are used to lend practicality. A chandelier dripping in crystals matches the sparkle of silver and mercury candlesticks on the table. 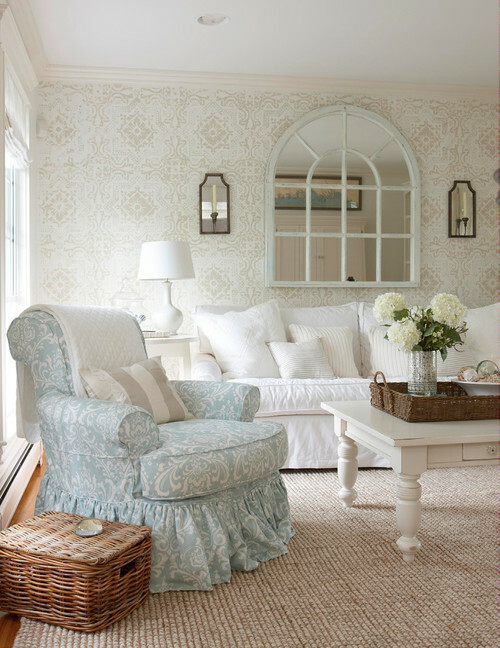 In the living room, romantic blue and white come together to create a feminine room. I love the little flounce on the arm chair, with its pretty fabric. 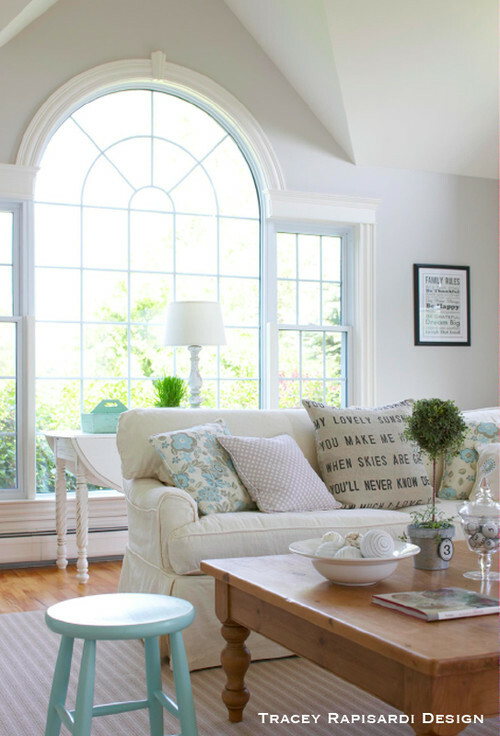 the mirror over the white couch reflects the design of the window found in the family room; a clever touch. A sweet reading corner in the bedroom adopts shabby chic style with white slipcovers and a ruffled ottoman. 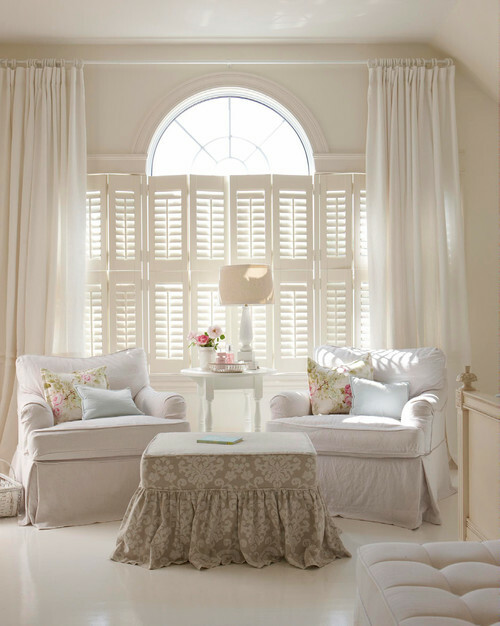 Painted-white wooden shutters help keep the sun’s glare to a minimum while draping curtains soften the window (another Palladian-style window). The painted bed reminds me of my own bed in my under-the-eaves bedroom. Soft white bedding pairs with plenty of shabby chic pillows to create the ultimate feminine bedroom. So pretty! You see more details of this charming summer house designed by Tracey Rapisardi. 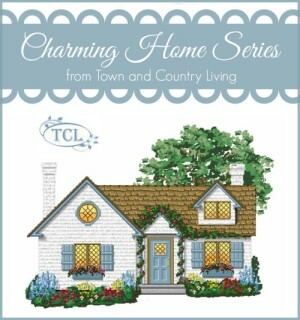 And you can see more house tours in my Charming Home Series. Love, love, love everything! The white is so fresh-looking, and the wood and wicker give added color and texture. And, the aqua is the perfect contrast! I could move right in! Oh my gosh! I absolutely love this cottage, especially the soft colors. I think this is truly the most beautiful home ever! I LOVE EVERYTHING ABOUT IT! My taste exactly! I could move right in and not change a thing! Thank you for this post! Well, it’s pretty. But it looks like only women live there. erased the male presence from this house. Not cool. Of course, there may be no male presence, in which, carry on. mess. Let’s get real, folks. Very pretty home ! I love all the white. Where do you find sleep covers for couches, love seats and ottomans ? I can’t seem to find any that look like the ” cottage style “. I think the house is very pretty. I love all the white ! Where do you find slipcovers for couches, love seats and ottomans ? I can’t seem to find them in the ” cottage style ” . I also think back to a day when farmhouses were one room n dirt floor so you would want a rug under foot for cleanliness n warmer on feet with only wood stove heat. Pre vacuum cleaner was the carpet beater. Yup the kitchen carpet has come a long way now being more ornamental n I sure think they look nice! So much cottage goodness! sigh! I love your blog. You have great ideas and style. But lately there are so many ads I can barely see the pictures or read the article in an enjoyable fashion. I know you have ads to make money but Is there anyway you can cut down on these? There have been other blogs I love but the same thing happened and I had to unsubscribe.